In the next segment of our Helmet Buying Guide series, we sort out what we consider the upper echelon of lids. All of the helmets in this guide have very pointed applications in that you will find the most extreme uses, be it racing, extreme dual sporting or serious hyper-mile touring. These helmets are $500 and up and feature the most space-age materials and technologies currently available. Lids in our Super Premium Motorcycle Helmet Buying Guide are made by AGV, Arai, Shoei, Bell & Shark. This level of functionality may be over the top for most riders so don't miss our Everyday Riding & Premium Motorcycle Helmet Buying Guides as well. First in our run of Super Premium lids is the AGV GP-Tech 5 Continents helmet was worn by MotoGP champion Valentino Rossi. The GP-Tech 5 is a carbon & kevlar construction that is lightweight and extremely aerodynamic with ventilation channels hollowed straight into the helmet's shell for superior airflow. The Racer-X visor that comes stock is anti-fog/scratch polycarbonate with a tear-off system and is easily changeable with no tools. The CoolMax moisture-wicking liner is fully removable and washable. 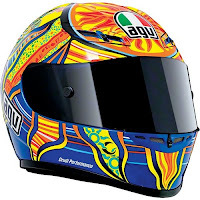 The AGV GP-Tech helmet is available in solids, graphics and a Marco Simoncelli version as well. With two MotoGP pros wearing this lid, you know AG Helmets has done something right. It is a intermediate to long oval fit. Bell Helmets, previously featured in our Premium Helmet Guide with the Bell Vortex, has made a major impact in 2010 with their new line of helmets. The Bell Star helmet, a Snell 2010 race helmet, is no exception. The Star uses the Bell Tri-Matrix composite which is kevlar, carbon fiber & fiberglass resulting in an extremely lightweight yet resilient lid. The ventilation is adjustable using the FlowAdjust system which creates great venturi airflow keeping your head cool and dry. With the built-in rear wing, the aerodynamics are extremely stable. Available in solid colors and a boatload of dope graphic options, the fit on the Star is ideal for an intermediate oval head but with the contour cut cheek-pads, it fits just about everyone well. Currently being worn by Randy De Puniet on the MotoGP circuit, the Shark RSR 2 helmet is the choice for the racer with the long narrow oval head shape. The RSR2 is constructed with a blend of carbon fiber & kevlar composited fibers and has a ventilation scheme and spoiler situated for riding in the tucked position. The EPS liner is built with multiple densities to provide maximum shock absorption in the event of a get-off and comes in two sizes to provide optimal fit. The ventilation scheme provides excellent airflow for on-track riding with large intake and perfectly-placed venturi side exhaust ports. The liner is fully adjustable, removable and washable utilizing CoolMax & Sanitized fabrics. This Shark helmet is DOT & ECE approved. The definitive race helmet of the 2000s, the Shoei X-11 led the pack since its inception in 2003. With upgraded Snell 2010 certification and some major improvements in design, the Shoei X-12 helmet took the reins this year and is truly a next generation pro-level helmet. The X-12 utilizes the strong and light AIM+ shell which comes in five shell sizes to create the most accurate fit possible. The Aero Edge 2 Spoiler has been streamlined more so than the X-11 to reduce down force and improve aerodynamics. The brand new CW-1 shield is a wider periphery than previous visors and has a spring-loaded quick-release mechanism for snug fit and swift shield changes. 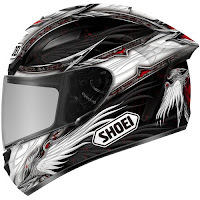 The Shoei X-12 is an intermediate oval shape. The last race helmet in this bunch, the Arai Corsair V helmet succeeds the RX-7 and boasts a veritable laundry list of improved functionality. The new fiberglass & kevlar shell features a Hyper-Ridge along the bottom which improves shell strength and widens the opening for easy on/off. The ventilation scheme is completely redesigned and flow a remarkable amount of air on the track at speed. The Arai SAI shield system is 5mm longer on each side for an exceptionally larger field of vision. One of the coolest features is the 5-way adjustable AirWing that allows for customizable aerodynamics that, to be honest, is second to no helmet on the market. 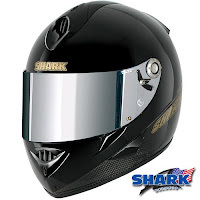 The Arai Corsair V is Snell 2010 certified and has an intermediate oval shell shape. 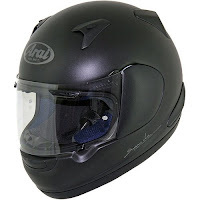 For long distance touring helmets in the Super Premium range, there is no competition for the Arai RX-Q Helmet. They basically took the Corsair V race helmet and made the necessary design adjustments to create an optimized touring helmet. It utilizes the same wider-eyeport face shield as the Corsair V in addition the same shell construction materials. The guts have been improved over the Quantum 2 helmet that it replaces, with newer multi-density cheek pads for an optimized fit. The shell shape is an intermediate oval with a smaller and more aerodynamic shape over its predecessor. The five unique shell sizes ensure that every size of this helmet will be the ideal fit. 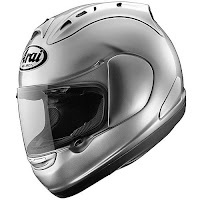 The RX-Q is a Snell 2010 certified race helmet built for the street. There are very few dual sport helmets whose functionality escalates them into the Super Premium realm. One of these helmets is the Shoei Hornet DS, a Snell 2005 ADV touring helmet. It uses the same materials as the X-12 in shell construction, the lightweight AIM+ shell, and has an extra-wide off-road style eyeport. The Hornet DS is exceptionally versatile and can be used three ways: with the visor and shield, with the visor and no shield, or with the shield and no visor. The 5-layered comfortable cheekpads are fully removable and have a channel for eyeglasses or goggles. 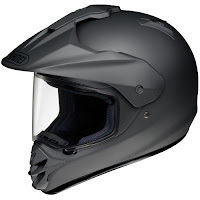 Like the majority of Shoei Helmets, the Hornet DS is an intermediate oval head shape. It is DOT & Snell 2005 certified. 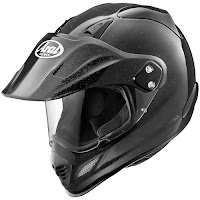 The top of the dual sport food chain is the Arai XD-3 Helmet. The fiberglass composite is stronger and lighter than previous iterations of this helmet and Arai used softer yet thinner materials in the liner for better comfort. The Twin-Cam Shield Pivot System provides a great deal of versatility with a face shield capable of use under the peak that is adjustable for aerodynamics depending on riding position. There are multiple optimized intake and exhaust vents designed to flow significant amounts of air and chinbar venting for shield de-fogging. Arai has been making dual sport helmets for a few years now and the XD-3 is the result of a great deal of R&D. It is an intermediate oval shape with Snell 2010 certification. If these helmets are overkill for your riding style, check out our Premium Motorcycle Helmet Buying Guide & Everyday Riding Motorcycle Helmet Buying Guide.